In partnership with One Omaha, Amplify Arts is hosting 2 workshops dedicated to crafting project proposals. What goes into writing a strong project proposal? How do timelines and budgets look when your proposal is mostly fleshed out but there are still a few unknowns? Join One Omaha Program Director Julie Smith as she lays out everything you need to know about writing a proposal that can help secure the resources and support you need to see your project through to completion. Attendance at one of these workshops is required to apply for the 2019 Public Impact Grant. Applicants who have previously received support from Amplify Arts in the form of an Artist Support Grant or Public Impact Grant must wait a full year after their grant term has ended to reapply. Please RSVP at this link so we can plan ahead. Red for power, yellow for happy, blue for competence; Power Colors, curated by Amanda Smith and Angela Zonunpari, examines the associative influence of color and its links to history, identity, and authority. Using a wide range of production skills, the four artists in the exhibition articulate and reconstitute fragmented experiences of place, personhood, and politics in vivid color. Marsha Mack (Denver, CO) and Nicole Maloof (Bronx, NY) use the color yellow as a lynchpin in their investigations of how cultural identity is shaped by language, social customs, and economic systems. For Maloof, that investigation begins with a simple question: What color is a banana? Mack’s approach is equally pointed, creating objects, images, and installation that reframe the experience of her Vietnamese heritage through the lens of a tourist. Amy Jarding’s (Sioux Falls, SD) intuitive use of color in her fiber-based work serves as lively counterpoint to these research driven practices, while Amanda Smith’s (Omaha, NE) highly personal sense of color, space, and vision recall “past lives” through the process of revisiting old paintings and reworking them as quilts; new objects, steeped in cultural tradition, that become carefully constructed retrospective heirlooms. In 2019 Amplify Arts will award $35,000 in grants to local artists. Our Artist Grants program seeks to eliminate financial barriers that a lot of artists face, allowing them time to experiment, create new works, or organize a public project. Get physically ready for the "Race" with free beverages, snacks, and a guided stretch. Get mentally ready for the "Race" with an artist-curated pump up playlist. Take a break during the race (because almost 4 football fields is a lot, okay?) and complete artist-designed obstacles. “Race” finishers can savor their achievement at the photobooth or donation station**. This “Race” is obviously very official, in that your status as a finisher is based on the honor system. We’re not keeping track of all those laps, ya hear? **Yes, this event is to celebrate our community’s giving day Omaha Gives, but you do not need to donate to participate. But if your heart is set on it we won’t stop you. Every donation we receive helps us support local artists and build a stronger Omaha through the arts. Print is not dead. Artist books and zines have a long, time-tested tradition of functioning as powerful marketing tools that continues today. Although making artist books and getting them out into the world can be an effective way of generating new audiences, there are some key factors to take into consideration when approaching publishing or self-publishing for the first time. Join Rachel Adams, Chief Curator and Director of Programs at the Bemis Center for Contemporary Art, for a session that tackles the pros and cons of both, assesses the current climate of arts publishing, and gets you on the way to circulating your work! Speaking about your work in public can be an intimidating prospect, but it’s also a great opportunity to explain what you do and why you do it to a captive audience. During this WAW session Rachel Adams, Chief Curator and Director of Programs at the Bemis Center for Contemporary Art, will lead participants through some organizational tips and tricks that can help ease the pressure of public speaking, engage your audience, and keep your talk on track. Participants must register for this session if they’re interested in securing one of the ten slots available to present their artist talk during August’s session. Documenting work can be tricky for artists of any discipline. Equipment, lighting, angles, perspective, post production workflow, and achieving high quality results on the cheap can all pose their own particular sets of problems. Join Amplify Arts Artist Support Grant recipient, Amanda Smith and DoSpace staff to learn more about DoSpace’s resources for artists and get some helpful hints and tips that will make your documentation of 2D, 3D, and performance-based work application ready. 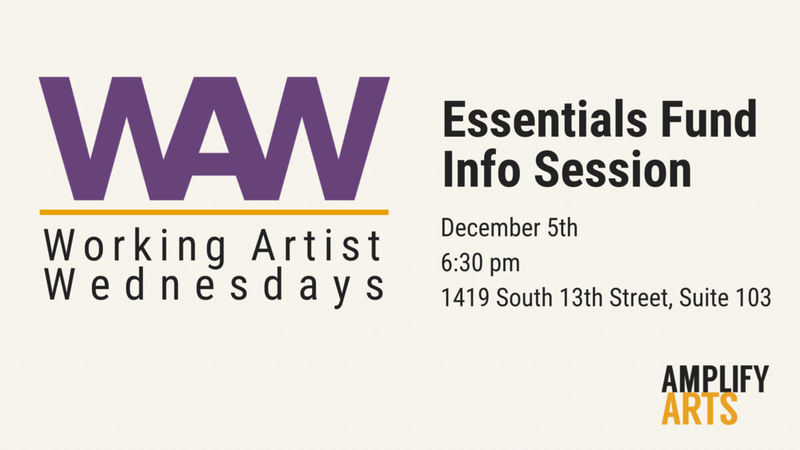 Always the first Wednesday of the month from 6:30-7:30pm, WAW is a series of important professional development topics for artists of all disciplines. Register for one or register for the whole unit. Each session is $5, or get access to all sessions for the year with an Amplify Arts' Artist Membership for $60! Purchase tickets at this link. PLEASE NOTE: This session will take place at DoSpace. What’s the difference between an artist resume and CV? How do you build each and which do you submit when applying for grants, residencies, jobs, fairs, and other opportunities? Amplify Arts Artist Support Grant recipient, Amanda Smith will lead WAW attendees through all the ins and outs of developing and updating comprehensive artist resumes and CVs that effectively communicate your experience, skills, and qualifications. All sessions are free for UNO students with a valid student ID. Special thanks to UNO's College of Communication, Fine Arts, and Media and their Center for Innovation, Entrepreneurship, and Franchising for making this partnership possible. Young Adult Living, curated by Kelsey Magnuson, uses portraiture to examine hierarchies traditionally embedded within representation; both who is represented and how. No religion, no royalty, no noble working class or peasantry, the works presented in Young Adult Living collectively call into question the conventions of traditional portraiture. Exhibiting artists Kelsey Magnuson, Nick Clark, Alyce Carrier, and Keegan VanGorder, examine the portrait’s impulse to faithfully depict the human form by interrogating the space between a subject’s immediate physical presence and the impression it leaves behind. Through ceramics, textiles, photography, drawing, painting, and printing processes, they find wiggle room within that space to create more expansive depictions of human experience with all its flaws and mundane lulls. Kelsey Magnuson is an Omaha based artist- recently returning from North Carolina where she first started working with film photography and later focusing on woven textiles. Her work with handwoven photographs is a combination of these two practices--cutting personal portraits and moments then weaving them back together alter the once still image through warp faced threads that obscure, conceal, pixelate and mimic the relationship of cloth on the body. These honest and intimate photographs, obscured and highlighted, touch on our collective and individual portrayals of self. They address cloth as a second skin with the capacity of carrying our histories and memories along with them. Amplify Arts is a 501c3 nonprofit whose mission is to promote unity, innovation, and progress in the arts to build strong and vibrant communities. The Generator Grants Program lends space and support to Omaha-area artists throughout the process of organizing, marketing, and mounting a curated exhibition outside the context of larger institutional systems. No matter what opportunities you’re looking for, a solid artist statement is an essential part of any application. Join Amplify Arts Artist Support Grant recipient, Amanda Smith to learn more about what makes a compelling statement and how you can use parts of that statement to develop a succinct elevator pitch sure to pique interest in your work. Join our 2018 Grant Recipients for a group exhibition that highlights their work and contributions to Omaha’s evolving creative landscape. 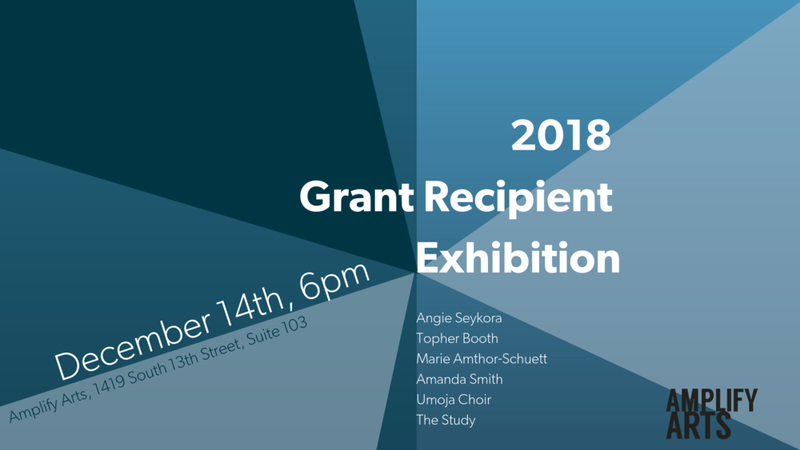 Angie Seykora, Topher Booth, Marie Amthor-Schuett, Amanda Smith, Dieudonne Manirakiza (Umoja Choir), and members of the The Study will be in attendance to discuss the ways in which being awarded Public Project and Artist Support Grants have impacted their careers, immediate communities, and the greater Omaha area. Guests are encouraged to ask questions, spend time with the exhibition, and fully engage with these exceptional artists and their work. Amplify’s Artist Grants program reiterates our mission to make Omaha a place where artists are able to live, work, and thrive. Awarded to individual artists and public projects, grant money contributes to the dynamic growth of a community rich in disciplinary and cultural diversity. Awards activate public spaces in meaningful ways and become catalysts for change in the careers of individual artists. Special thanks to the Pape Family Foundation and Annette and Paul Smith for their generous support and making the 2018 Grants Program possible. Amplify's Essentials Fund is made up of two separate categories - Emergency Grants and Micro Grants. This pot of money was instated to increase access to professional tools and respond to unforeseen events that negatively impact an artist’s practice. On December 2nd, Amplify will begin accepting applications for Micro Grants which are one-time grants for capacity-building support items like supplies, research materials, travel, business cards, and professional development (excluding Amplify Arts Programs). Join Amplify staff for a special session of Working Artist Wednesday dedicated to demystifying the application process. Get a rundown of what you'll need to apply, eligibility requirements, and a first hand look at how we jury grant applications. Questions are welcome. Please RSVP to attend.